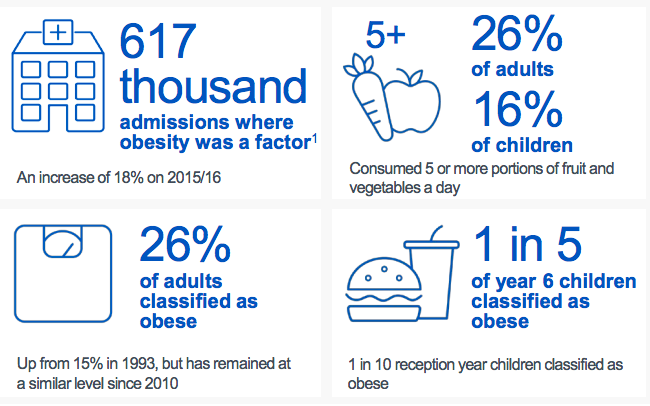 Taken from statistics from 2015/2016, only 16% of children were consuming 5 or more portions of fruit and vegetables a day, the foods that are classed as possibly the MOST nutritious for us, filling our bodies with vitamins and minerals. 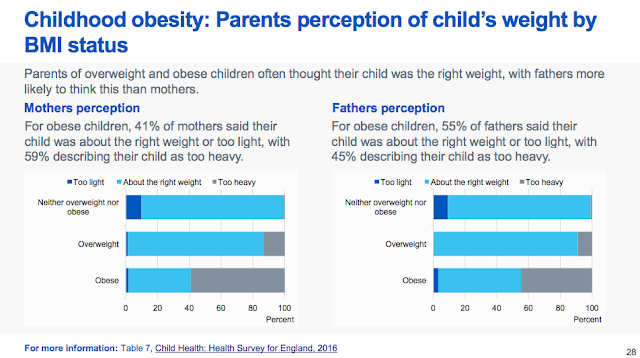 Furthermore, the facts go on to show that 1 in 5 year 6 children were obese with 1 in 10 reception children being classified as obese, this all being based on BMI. Now although there is some dispute of how good the BMI test is, it only really has major flaws for people such as athletes and bodybuilders who have body compositions away from the norm. 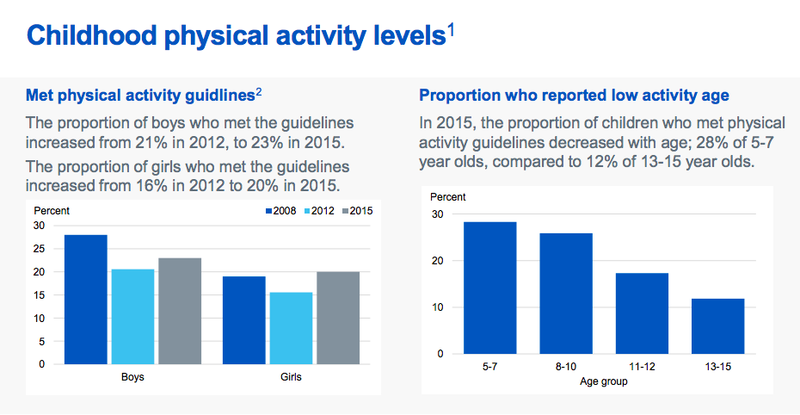 But there is a clear message that unfortunately children in the UK are becoming heavier which really can have terrible repercussions later on in life, not to mention the few clear problems such as type two diabetes, cardiovascular disease and heart attacks. But why is the problem getting worse? You can see from the tables above that physical activity levels is an issue that needs to be addressed, and although things are improving from 2012, only 20-23% of children are meeting the activity guidelines provided by the government. This is classed as moderate to vigorous activity for 60 minutes per day, not including during school time. This can include activities such as playing outside, swimming, cycling, gymnastics, the list goes on and on! The problem a lot of parents have is having the time to take their children to these activities, maybe intertwining your own workout with your child's exercise time could encourage your child to exercise more, whilst you get a workout in too. This could include taking them to their class in the local fitness centre whilst you go to the gym, or going for a family bike ride once a week, take a picnic and make a day of it! However, before the issue is addressed, it appears that some parents are not aware that there is an issue at all. 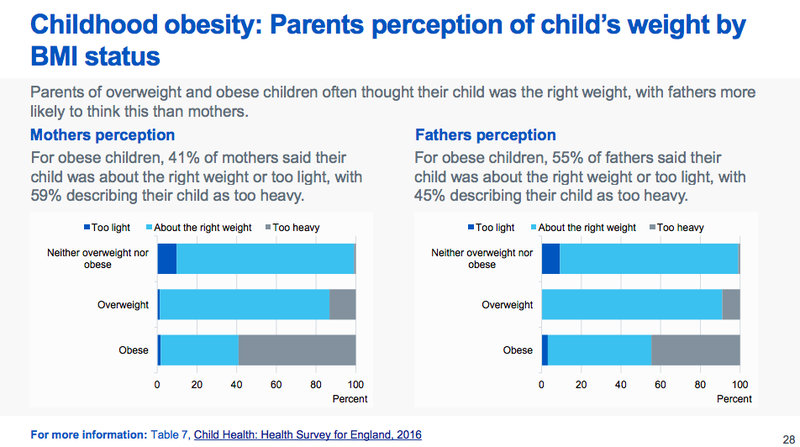 41% of mothers and 55% of fathers thought that their child was the right weight or too light when they were in fact obese. It is clear to see that adults may need to be made aware of the issues and this is in fact the first problem to tackle. But, going about this the right way may be tricky. Schools have now begun weighing children to find out their BMI and referring them to a dietician is necessary. Although, this does help to identify the problem with parents, putting a timescale of making the child lose weight can put a lot of pressure on both the parent and the child. 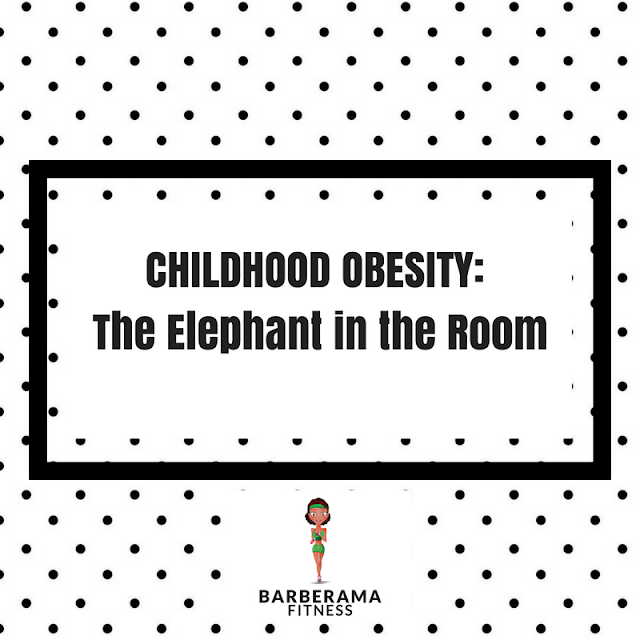 Being a healthy shouldn't be seen as a task or chore, simply a way of life, and forcing a child to lose weight in a short space of time, in a forced way could impact the way they deal with their weight negatively as an adult. The Eatwell plate can be a great place to start if you are having trouble working out what to eat, it shows you an estimate of how much fruit and veg you should have a day, as well as starchy carbohydrates, protein, dairy and the few sweet treats that should be in moderation. Check it out here. Now the sun is shining you've got no excuses not to get outside and do some exercise. Organising family days out on walks, cycles, playing in the park is easy and relatively cheap compared to a lot of other activities. Plus, if you're staying fit it encourages your children to stay fit too and shows a healthy way of living. Don't make it the job of mum to make all of the meals, get the kids involved too. If you can teach your children a bit more about food, where it comes from and what it does for your body, they will have more of an incentive to make the right choices. check out the Change 4 life website where they give you a variety of easy recipes you can make to give your children healthier meals. I love good smells in my room. I have been using best oil diffuser for a long time. I am really satisfied with this, as this helps me to sleep well. Also reduces my anxiety, depression and other issues. I am really happy to use this. This is really good in quality, as far I used others.